In mid May we had scheduled a trial performance of The Hidden Pin Up at a venue in Manchester, which for reasons beyond our control had to be cancelled. It was a bit of a blow but rehearsing in situ and developing the performance to a near finished version gave everyone a chance to see our collective ideas weave together. Lenai, our fantastic dancer from Manchester's House Of Ghetto (HOG), did sterling work picking up where we'd left off from our first choreography session a few weeks back. For the trial performance we wanted to use a staircase as the stage area as this was to be an intervention, treating the audience to an unexpected experience from their viewpoint gathered at the stairs base. 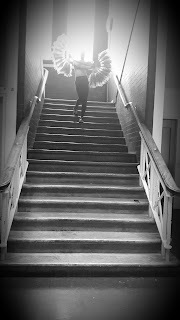 Using our chosen song of Miss Celie's Blues for the first half it took Lenai no time to adjust to the diagonal ground of the stairs while using the hessian fans to recreate a traditional fan dance. The results were stunning as the stairs lent an air of magic to the piece, literally letting Lenai appear far above our heads with natural light shining behind her and through the fans. As she made her way down the steps instinctively matching her moves to the words and breaks in the song, both myself and HOG choreographer Darren Pritchard, knew that this was going to be a very strong piece. Once Lenai was on a level with the audience our idea to flip the script and introduce a modern Vogue beat for the second half of the performance took shape. This was especially exciting for me as I was intrigued to see how the very different moves of Vogue dancing would fit the piece and I was not disappointed. As a professional dancer with a strong Vogue background Lenai added a sophisticated sensuality that matched the fluid movements of the burlesque section to perfection. 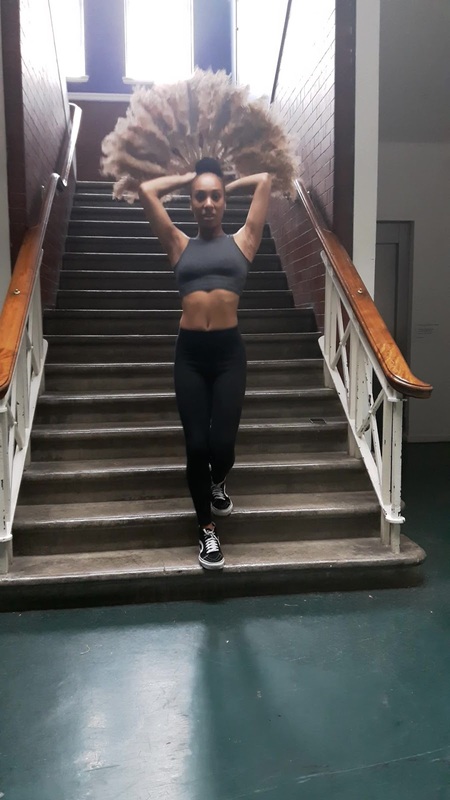 Our plan was to have live vocals performed by Justina Aina the fab singer who we recently worked with to create our own Vogue track for the piece. Her confrontational use of the words I have stitched into the fans would have juxtaposed brilliantly with Lenai's graceful ascent back up the stairs, eventually to disappear like a dream that once was. Unfortunately we never got to try this out but from the groundwork already done, both Darren and I know this would be a powerful blend that would leave a lasting impression on the audience. As we progress on this project there will be much more to come so watch this space!